Over the past few years, German players have dominated the exploding Super High Roller scene. But while that’s been happening, one of the country’s best has been unable to find the winner’s circle. 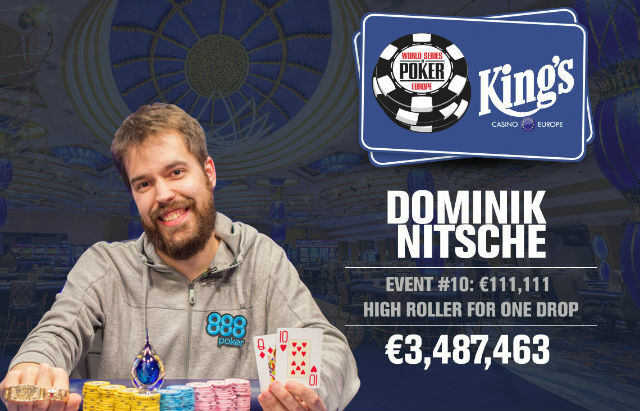 That changed on Sunday at WSOP Europe as Dominik Nitsche won the €111,111 One Drop High Roller for his fourth career WSOP bracelet and €3,487,463. Martin Kabrhel has already won one bracelet over the last two weeks, on Sunday he came close to winning another one. Having held the chip lead multiple times during the first two days of this event, some expected Kabrhel to contend entering Day 3. Nitsche put a stop to all of that. With blinds of 600,000/1,200,000 (200,000 ante), Nitsche raised to 2.5 million from the hijack before Kabrhel made it 12,000,000. Nitsche responded by moving all in and Kabrhel called. Nitsche showed which put him slightly behind Kabrhel’s . Nitsche picked up a flush draw on the flop. The turn kept Kabrhel ahead, but the river gave Nitsche his flush and eliminated Kabrhel in eighth. Nitsche was responsible for the next elimination as well, this time sending the lone amateur at the final table, Ahadpur Khangah, out. Action folded to Khangah in the small blind and he defended, Nitsche raised to 3,200,000 and Khangah responded by moving all in. Nitsche called and showed and found himself racing against Khangah’s . The board ran out to give Khangah Broadway that turned out to be second best to Nitsche’s full house. It took about an hour for another player to run out of chips and this time, it was one of the four Germans who made the final table. Mikita Badziakouski raised to 4,500,000 from the button before Christoph Vogelsang re-raised all in for 13,600,000. Badziakouski tabled which put him behind Vogelsang’s [ahqd]. The flop put Badziakouski ahead with two pair and neither the turn or river were able to bring Vogelsang’s hand back from the dead and he was eliminated in sixth place. German-on-german violence lead to the next elimination. Andreas Eiler moved all in from the button for just over 60,000,000 and Steffen Sontheimer called from the big blind. Elier held and Sontheimer was ahead with . The flop moved Eiler in front. Neither the turn or river were any help for Sontheimer and he was sent to the cashier window in fifth place. A few hands later, Nitsche went back to working his role as executioner. From UTG, Nitsche raised to 4,500,000 and action folded to Thomas Muehloecker in the big blind. He moved all in for 5,025,000 and Nitsche called. Muehloecker turned over which put him well behind Nitsche’s . The board ran out to eliminate Muehloecker and further Nitsche’s lead. Nitsche assumed the role of bystander for the next elimination. Eiler opened to 5,500,000 from the button, Badziakouski moved all in from the big blind for 59,200,000 and Eiler called. Badziakouski showed while Eiler tabled . The flop was a safe one for Badziakouski, but the turn moved Eiler in front. The river changed nothing and Badziakouski was eliminated in third. The final two players played for another 2.5 hours before Nitsche finally put Eiler away. Down to just eight big blinds, Eiler moved all in and Nitsche called. Eiler got good news when he turned over and found himself ahead of Nitsche’s but the flop moved Nitsche in front. The turn was no help and the river gave Nitsche trips to finish Elier off in second and give Nitsche his fourth career bracelet.